Although flu shots aren’t foolproof, they are generally quite effective at preventing the flu and carry very few risks. If you want to discuss this issue in detail before making a final decision, don’t hesitate to bring it up to your family doctor. Research shows that 4- and 5-year-olds are pretty good at listing accurate reasons for why someone might get sick. However, they also make plenty of mistakes, which is why it’s important to talk to your kids about germs and hygiene on an ongoing basis. By making a point of always explaining the “why” you’ll be able to help your children build healthy habits. One of the most effective ways to avoid germs during this time of the year is consistent hand washing. But this is also something kids often want to skip when they’re in a rush to get back to playing. In addition to always setting a good example, you can also make this activity fun by turning it into a type of game with your kids. Hand washing isn’t the only activity that does a very good job of preventing illness. Eating a balanced diet with plenty of vitamins and getting ample sleep is also essential for keeping everyone’s immune systems working as effectively as possible. So if your family has been falling short in either of these areas, now is the perfect opportunity to get back on track. If your kids go to a childcare facility, that’s the location where they’re most likely to pick up germs and bring them home. The truth is that no amount of work on your part is going to help if your childcare provider isn’t on board with healthy practices as well. At All About Kids, we utilize multiple strategies to keep all the kids we care for healthy. In fact, one of the key features of our LEED-certified building is our ductless rooms. This design reduces bacteria and viruses, as well as keeps germs restricted. 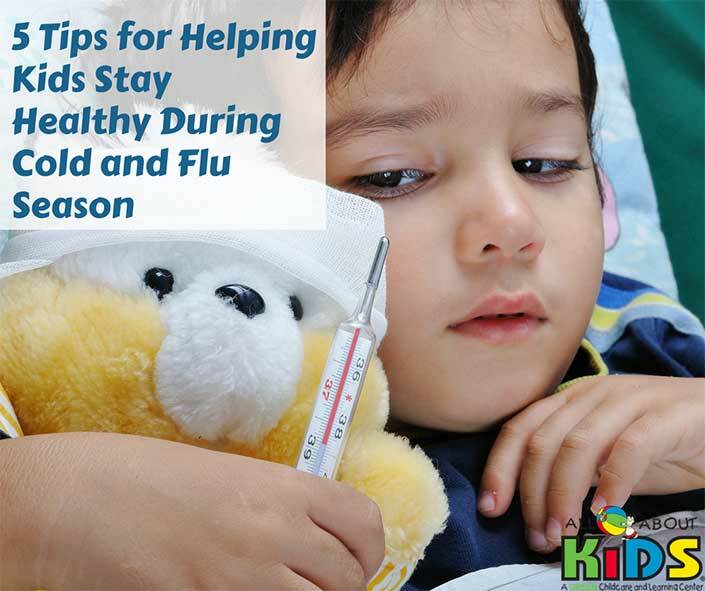 By considering flu shots, talking to your kids, setting a good example, staying consistent and choosing the right childcare, your family will be able to minimize downtime due to sickness and enjoy a wonderful holiday season!